A CFA member cat club. 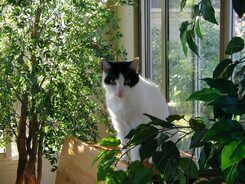 Do you have a much loved domestic cat or kitten that you think is terrific? Have you ever thought about showing your feline family member at a cat show. Well you can in the Household Pet (HHP) division of a CFA cat show. Don't be afraid to give it a try. If your cat is friendly, not easily frightened and likes attention, chances are it will do well and you will have a good time showing your cat. To be shown, all household pets must be at least 4 months old, not declawed and in good health with no evidence of fleas, ear mites etc, and up to date with their core vaccines including rabies. Cats 8 months or older must be spayed or neutered. Nails should be clipped on all four paws before leaving for the show. You don't need to bring your vaccine records but it is good to have them on hand. Ask your vet, they can provide you with a copy. HHP's are judged on condition (general good health), uniqueness, temperament and grooming. Collars must be removed. Of course you will want your cat to look its best, so most people bathe their cat one or two days before a show. This makes sure the cote is clean and allows time for the natural oils to return. Once you have sent you completed entry form, you are ready to prepare for the show. Be sure you have a carrier to transport your cat. Wire show cages are provided for each entry. They must be covered by "cage curtains". These are for covering the cage on all three sides plus top to prevent your cat from seeing its neighbors. Some people who show regularly have spectacular curtains and decorations for their cages. Most keep their curtains simple but attractive. One large piece of material to cover the back, sides and top of the cage will do just fine. Twin size sheets work well. Colorful beach towels are another possibility. It is a good idea to securely fasten the curtains with large safety pins or binder clips. You will also want something to cover the table under the cage. A towel or bath mat the size of the the cage works well. Cat litter is provided but you will need to bring a small litter box. Bring cat food, kitty treats and a toy or two for your cat. Also bring small dishes for food and water. Include something to scoop our the litter box as needed. If this is your fist show please let the entry clerk know this when you enter the cat. Arrive at the hall at least an hour before the scheduled start of the show. Your cat must be in some type of carrier. When you arrive there will be an entry clerk at the door. Let them know that you are a new exhibitor. (Most clubs will assign someone to help you through your first show.) He/she will check you in, give you an entry number, a show catalog and tell you the row you have been assigned. Locate the row and your name will be on a cage. Set up the cage with your curtains etc, before putting in your cat. Now check the catalog to see when and where the judging will take place. When your number is called, take your cat immediately to the ring and put it in the judge's cage under your number, sit down with the audience and be proud. This will happen several times during the day depending on the number of judges. Once all the household pets have been judged the ring clerk will tell you the the cats may go back. Take your cat back to the benching cage. You may take the merit ribbon if you wish. Each judge will see all the HHPs and then choose few to return for what is termed "finals" If you hear your number called for this, take your cat immediately back to the ring for a special award. There will be a lot of time between judging. Use this time to enjoy visiting the vendors, touring the show hall and meeting other exhibitors. It is always a good idea to ask your neighbor to keep an eye on your cat when you are away from the cage. 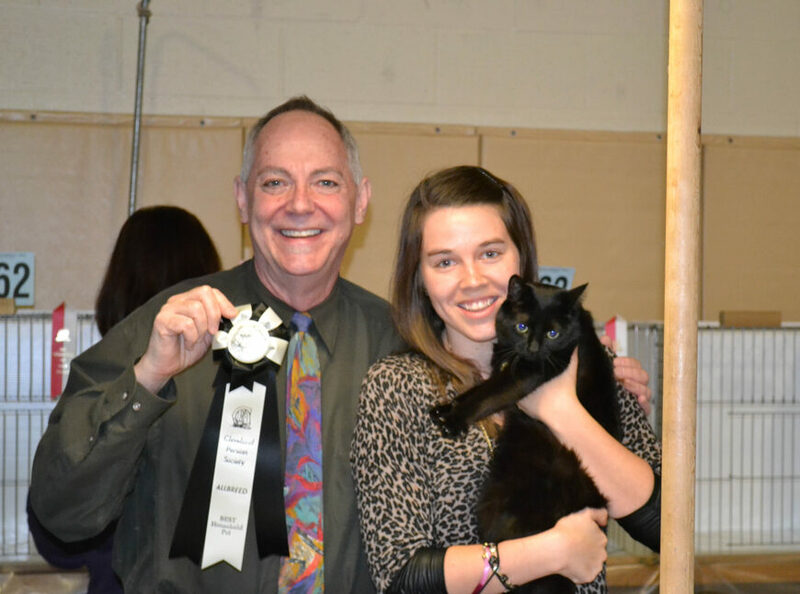 Whether or not your pet receives any rosettes or awards, it is a special time to share with your pet. You will feel much pleasure and pride when your cat receives the admiration you have always known it deserves, and most cats actually enjoy the pampering and extra attention. So if you have been considering showing your pet "go for it". 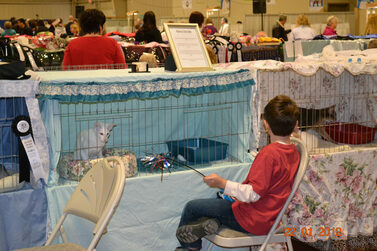 A cat show is fun, educational and most gratifying. Information taken in part form CFA's Southwest Region Household Pet web site. 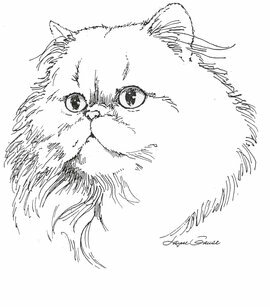 HOUSEHOLD PET DEFINED: A household pet is any cat not eligible to be entered in another class at the show. A registered purebred which is disqualified for competing in another class may be entered as a household pet. Cats with wild blood lines such as Bengals or Savannahs may not be shown as a household pet. AGE OF PETS: Household pets must be at least 4 months of age or older on the opening day of the show. There is no upper limit for age. Household pets 8 months of age or older must be spayed or neutered to participate in the show. AGE OF OWNER: Exhibitors should be at least 18 years of age. Children under 18 must have permission of a parent or guardian to participate. HEALTH: All entries must be free of disease, fungus and parasites and up-to-date on their vaccines. It is strongly recommended that all cats entered in the show be inoculated for protection against Feline Enteritis, Rhinotracheitis, Calici Viruses, Rabies and tested for FeLV. Adults 8 months or older must be spayed or neutered. All entries must have claws clipped on all four paws. Pets should be bathed before the show. It is recommended that the ears be gently cleaned before exhibiting and that teeth be cleaned if necessary. DECLAWED CATS: Declawed cats are not eligible for entry in CFA cat shows. SHOW HOURS: Check-in time for exhibitors is usually from one hour before the show. Exhibitors are expected to be in the show hall with their cats during the advertised show hours. Permission to leave the show hall early may be requested from the show manages. AMENITIES: Litter is generally provided. Bring your own litter trays, food, dishes, toys, blankets or bed for the comfort of your cat. OTHER PETS: Only pets eligible for show may be brought into the show all. Only pedigreed kittens or shelter kittens (with permission of show management) may be for sale. AWARDS AND ROSETTES: Ribbons and rosettes are awarded in accordance with CFA Show Rules. Rosettes will be awarded to the top 10 in HHP Division.